He is a member of “Russia Painters Union”. Vladimir Istomin was born in 1939. In 1967 he graduated from art-graphic faculty of Nizhny Tagil state pedagogical institute (Nizhny Tagil, USSR). In 1967 - 1969 he taught at the graphic art faculty of Nizhny Tagil state pedagogical Institute. In 1969 - 1973 he lived in Kurgan. Where he worked in art and industrial workshops of art fund of Russia and in the Institute of experimental orthopedics and trauma surgery creating the sketches of apparatuses for operations. In 1973 he moved to live on Chukotka region (USSR). In 1992 - 1999 he was Chairman of the Chukotka branch of “Russia Painters Union”. In 1989 – V. A. Istomin awarded the title of Honored artist of the Russian Federation. In 1999 he was awarded the title of Honorary citizen of the Chukotka Autonomous area. In 1991, 1992 and 1993 - international painter artist of the transcontinental race on a dog sled "Hope" on the route Nome (Alaska/USA) – Anadyr (Chukotka). Creatively worked in the houses of creativity: 1981, 1987, 1990, 1993 – “Chelyuskinskaya”, 1984 – “Gurzuf”, 1995 – “Academic”. In 2002-2004 in cooperation with the Honored artist of Russia L.G. Sudovym and artist L.K. Wawrzenczyce worked on a series of portraits of military leaders for the General Staff Academy, Moscow. He currently lives and works in Nizhny Tagil. 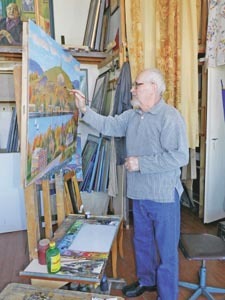 Vladimir Istomin works in easel painting and graphics technique. Has taken part in many all Russia, regional and city exhibitions. Museum-estate of A.S. Pushkin "Mikhailovskoye"
Nizhny Tagil Museum - reserve "Mining Ural"
in museums of Magadan, Anadur, Habarovsk (Russia). and in private collections in Russia and abroad.